This week's tablehopper: food frenzy. 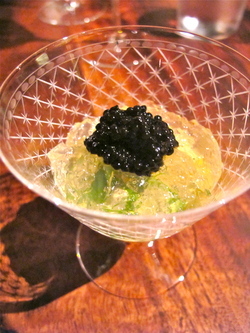 Fancy feast: reserve caviar, corn pudding, grilled tomato gelée (in the lounge at Saison). Photo: © tablehopper.com. You ready to strap your feed bag on for the month of August? It’s shaping up to be a doozy, starting with the kick-off for SF Chefs this weekend (check out today’s sugar mama for a ticket giveaway). Next weekend is Outside Lands (or as my sister and I like to affectionately call it, Outside Lambs), which is as much about the food, beer, and wine as the music. And then the weekend of August 17th is the Street Food Festival, kicking off with the Night Market on Friday August 16th. (Psssst: for $10 off your ticket, use code tablehopper, but act quickly, because it expires August 1st! After 8/1, use code tablehopper2 and you’ll get $5 off.) Last week, La Cocina hosted a preview of the many dishes and vendors who will be serving that weekend—yeah, it’s going to be another extravaganza. Wear your fat pants or a kaftan. I had a glorious time hanging out with my family in Tahoe over the weekend—even though I still had too many writing deadlines, there’s nothing like eating sandwiches and drinking cold beers on the beach after a dip in the lake, grilled chicken and summer tomato salads, and catching up on all my magazines (hello, New York magazine from March). I also sleep so well up there, the altitude is like nature’s Ambien, I swear. And the final bonus: picking up peaches from Ikeda’s in Auburn on the way home. Hello, fragrant Elbertas, ripening on my kitchen table. This week is packed with new restaurant and bar openings and sneak peeks, check it all out. I am not sure I’m going to be in your inbox on Friday—this week is all kinds of crazy. See you at SF Chefs? Party on.